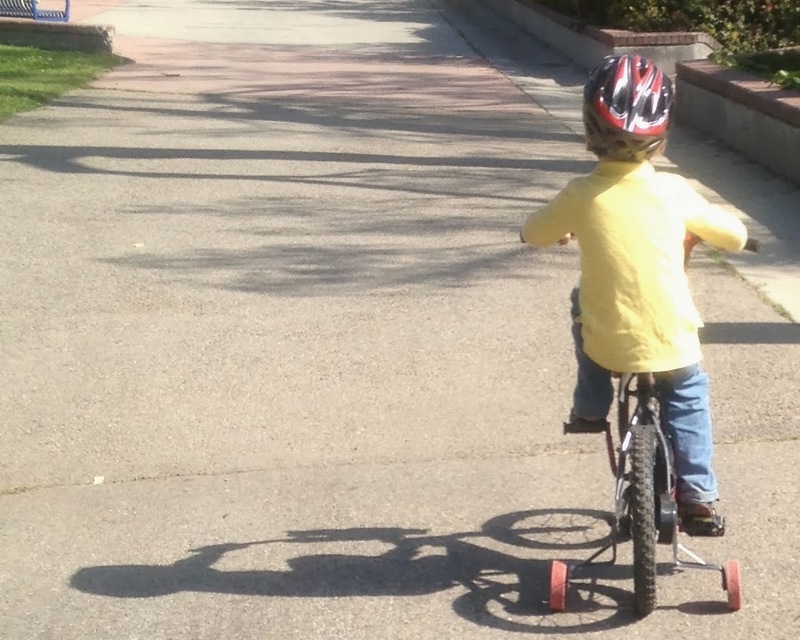 When my son was sixteen-months-old we received a hand-me-down tricycle from a neighbor. My son LOVED it. His Dad outfitted it with new handlebars and a shiny new seat and my son's face would just light up whenever he got a glimpse of the thing. Long before his feet could even reach the pedals my guy would sit on top of his tricycle happily or push it up and down the front walk, squealing in delight. Eventually his little legs grew big enough and he mastered the pedals and spent long afternoons zooming up and down our driveway. When he turned four we moved our son up to a big boy bike with training wheels. Outfitted with a slick new Spiderman helmet, he was finally ready to leave the confines of our gated house behind and take to the open sidewalk! Since he didn't have the leg strength to get the bike going I'd give him a nice big push to start off each ride. We live in a bustling neighborhood in Los Angeles, so I walked next to him as he made his way slowly forward, warning him all the way to watch out for upcoming driveways. I instructed him on how to push the pedals in the opposite direction in order to stop and walked a few steps in front of him to form a human blockade until he had it figured out. Then there was the problem of concentration. One of the wonders of being out on a bike for my son was that there was just so much to look at from his new bike-y perspective. He'd reach out to touch trees and flowers as he passed. He'd search the skies for passing airplanes and turn to shout important Toy Story 2 plot points to each and every passerby. "You need to look where you're going or you'll crash!" and he'd ignore me and crash into things and then, completely unfazed, he'd dust himself off, get back on his bike and keep rolling. For hours on end we explored the neighborhood on two wheels. Soon my kiddo no longer needed a push to get started and he almost never needed help getting over the bumpy parts of the sidewalk. Each day he rode a little faster and a little more confidently -- which left me quickening my pace so that I could stay right by his side providing reinforcement and reminders and standing at the ready to grab him if he fell. Sometimes we'd be joined by his brother on his tricycle and his sister in her stroller. When I was supervising all three of them I had less time to monitor my big guy's biking skills, and so I had to just sort of linger behind, only jumping in to get involved at signs of trouble. Then finally yesterday afternoon I took my son out for our usual after-school ride. As we started down the sidewalk to make the loop around our cul-de-sac I found myself having to run at a brisk pace to try to keep up with him. I was getting winded after the first lap, and by the end of the third loop I realized it was hopeless -- I just couldn't keep up anymore. And so I stopped running and I let my son head off without me by his side. All I could do was hope that all that time I'd spent shouting instructions and providing all those lifts over bumps had somehow implanted in his little brain all the lessons I'd offered along the way. I had to trust that he would remember them as he headed off on his own, leaving me behind to worry and to hope. And if that ain't a perfect metaphor for parenthood, folks -- I don't know what is.